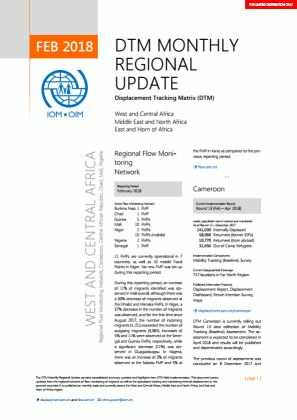 The DTM Monthly Regional Update contains consolidated summary updates and highlights from field DTM implementation. 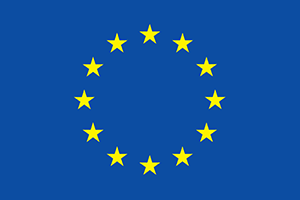 This document covers updates from the regional network of flow monitoring of migrants as well as the tracking and monitoring of internal displacement in the country. 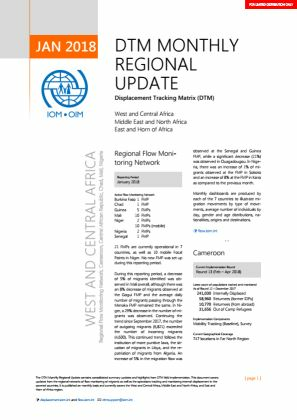 The DTM Monthly Regional Update contains consolidated summary updates and highlights from field DTM implementation. 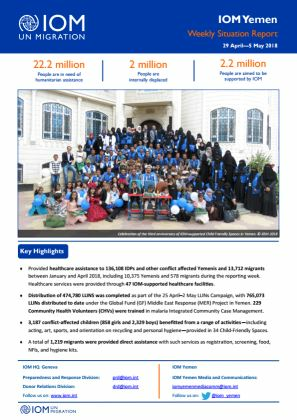 IOM is the co-lead of the Task Force on Population Movements (TFPM) and is responsible for tracking IDP and returnee movements across Yemen. IOM’s coastal search and rescue teams for migrants found 313 new arrivals (80 boys and 233 men) in Lahj. 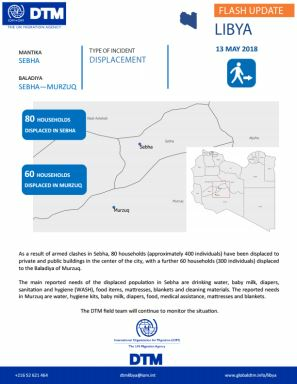 As a result of armed clashes in Sebha, 80 households (approximately 400 individuals) have been displaced to private and public buildings in the center of the city, with a further 60 households (300 individuals) displaced to the Baladiya of Murzuq. الجميل: في الفاتح من مايو، بلغنا وقوع اشتباكات بين جماعات محلّية مسلّحة وأهالي الزنتان على أطراف مدينة الجميل. 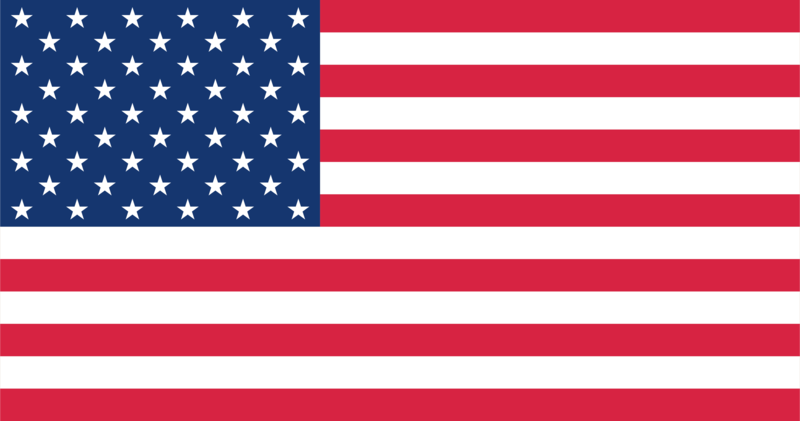 ولم يحدث نزوح نتيجة لذلك ولا زالت الجهود المسخّرة للمصالحة قائمة على قدم وساق. 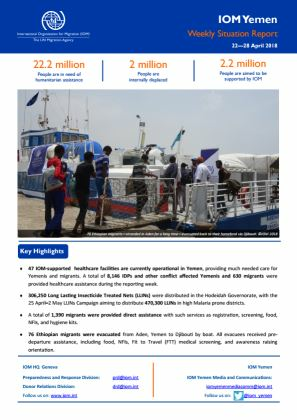 IOM is the co-lead of the Task Force on Population Movements (TFPM) and is responsible for tracking IDP and returnee movements across Yemen. 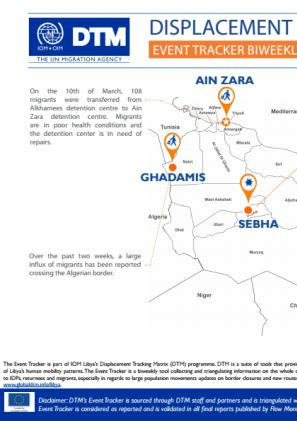 Published on a bi-weekly basis, the Displacement Event Tracker reports on incidents related to IDPs, returnees and migrants, especially in regards to large population movement updates. 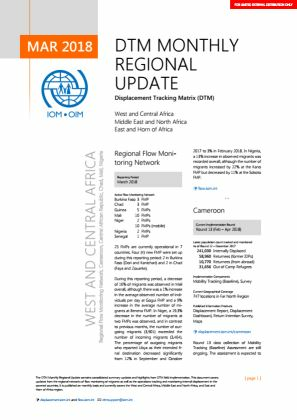 IOM's Displacement Tracking Matrix has been monitoring displacement movements since 15 October 2017, when Iraqi security forces began moving into disputed areas that had previously been held by Kurdish forces. 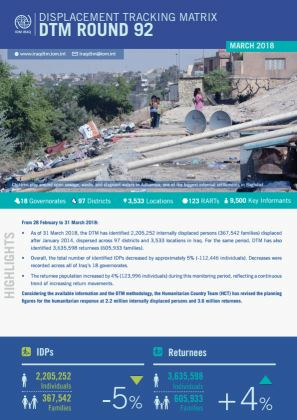 As of 31 March 2018, the DTM has identified 2,205,252 internally displaced persons (367,542 families) displaced after January 2014, dispersed across 97 districts and 3,533 locations in Iraq. 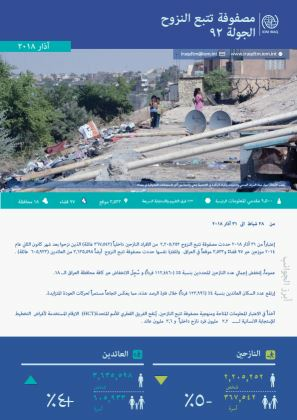 إعتبارا من 31 آذار 2018 حددت مصفوفة تتبع النزوح 2,205,252 من الافراد النازحين داخلياً (367,542 عائلة) الذين نزحوا بعد شهر كانون الثاني عام 2014 موزعين عبر 97 قضاءً و 3,533 موقعاً في العراق. 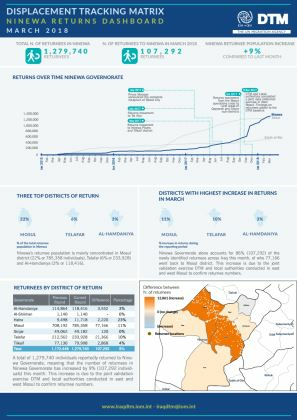 A total of 1,279,740 individuals have reportedly returned to Ninewa Governorate, meaning that the number of returnees in Ninewa Governorate has increased by 9% (107,292 individuals) this month. 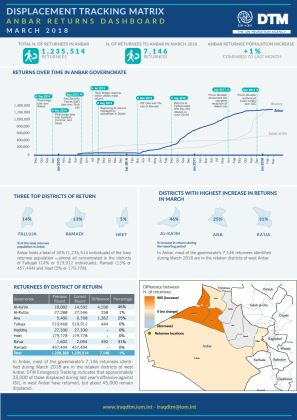 In Anbar, most of the governorate’s 7,146 returnees identified during March 2018 are in the retaken districts of west Anbar. 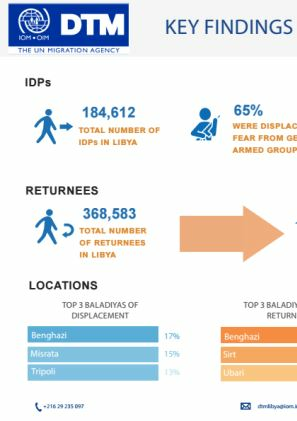 The publication presents DTM's Round 18 complete information packages on Libya's IDP and Returnee Populations. 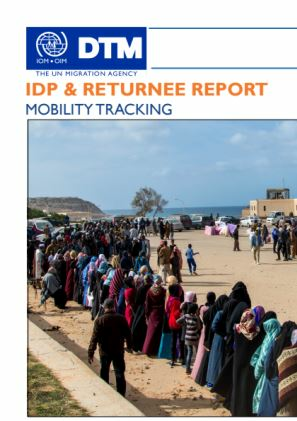 DTM's Round 18 covers the period of mid February to March 2018, delivering a comprehensive Mobility Tracking report on Libya's IDP & Returnee population. 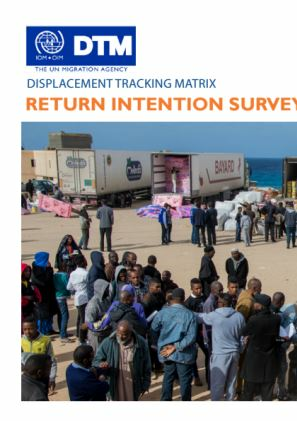 In March 2018, the Displacement Tracking Matrix Libya (DTM) conducted a demographic and socio-economic survey of the Tawergha internally displaced person (IDP) population living in IDP settlements across Libya. 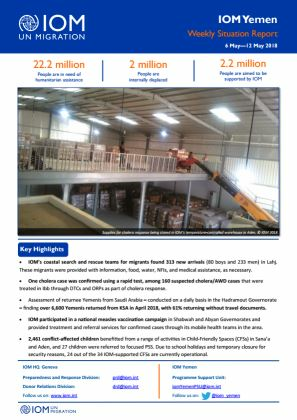 This publication presents DTM’s Round 18 key findings on Libya’s IDP & Returnee populations. DTM’s Round 18 covers the period of late February and March 2018. As of 28 February 2018, the DTM has identified 2,317,698 internally displaced persons (386,283 families) displaced after January 2014, dispersed across 97 districts and 3,680 locations in Iraq. 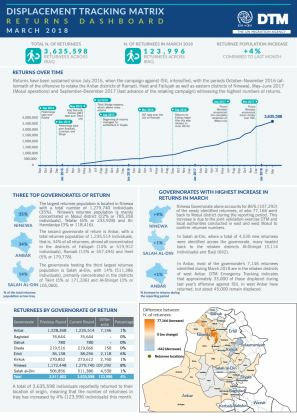 For the same period, DTM has also identified 3,511,602 returnees (585,267 families). 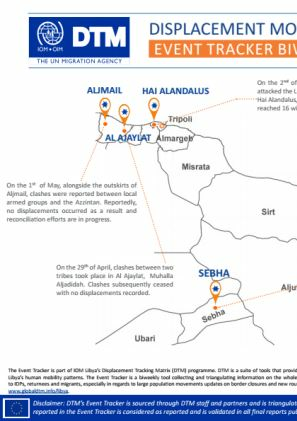 As a result of continued armed clashes in the city of Sebha, 720 households (approximately 3,600 individuals) have been displaced to the Muhallas of Al minshiyah (530 HH), Sakra-Mahdia (140 HH) and Ubari (50 HH). 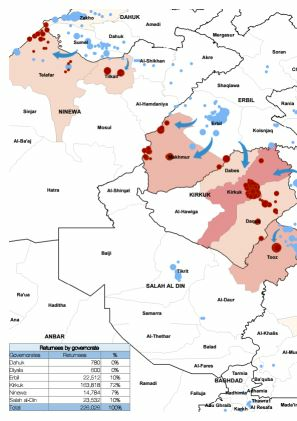 IDPs continue to wait in order to return to their community of origin as their number increases. 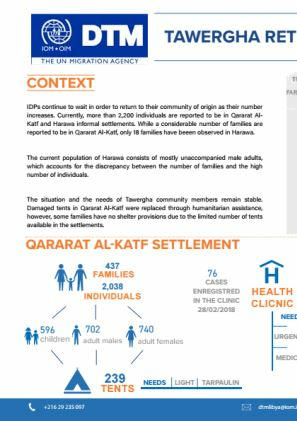 Currently, more than 2,200 individuals are reported to be in Qararat Al-Katf and Harawa informal settlements.